The awards recognise "anyone who has an impact on Postgraduate education in the UK" according to Mike Hill, chief executive at Graduate Prospects. "This is at all levels; from the businesses forging ties with their local institutions, the media and marketing agencies that drive the campaigns, to the universities themselves who are wholeheartedly and creatively attracting postgraduate talent." LSBU's team is shortlisted in the category of Best Teaching Team (Business and Social Sciences). 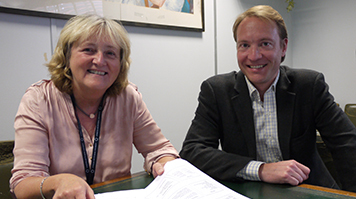 Stephen Barber, EMPA Associate Course Director, said, "this is excellent news and testament to the strengths of LSBU's Public Administration teaching team. The team is dedicated to both the courses and advancing the subject area. I think it is this which helps us stand out from the crowd. "And in addition to the programmes run here in the university, it is one of the reasons that we have been commissioned by several employers to provide top quality education in the workplace." Chrissie Oldfield, EMPA Course Director, attributed their shortlisting to the team's long experience working with mature and part-time Masters students. Chrissie said, "They are students who need to juggle the busy demands of work, professional duties and home life, as well as those who are facing the demands of post graduate study for the first time. It's because we value our students and the experience they bring to the programme and work to make the EMPA a worthwhile and rewarding experience for them personally, professionally and academically." Winners and finalists will be chosen by the judging panel which will include representatives from the National Union of Students, the Higher Education Funding Council for England and the Association of Graduate Recruiters. The winners will be announced in a ceremony in Manchester on 10 November. LSBU's Executive Master in Public Administration programme is part of the Government's Skills Framework and is ranked Number 1 in the UK.